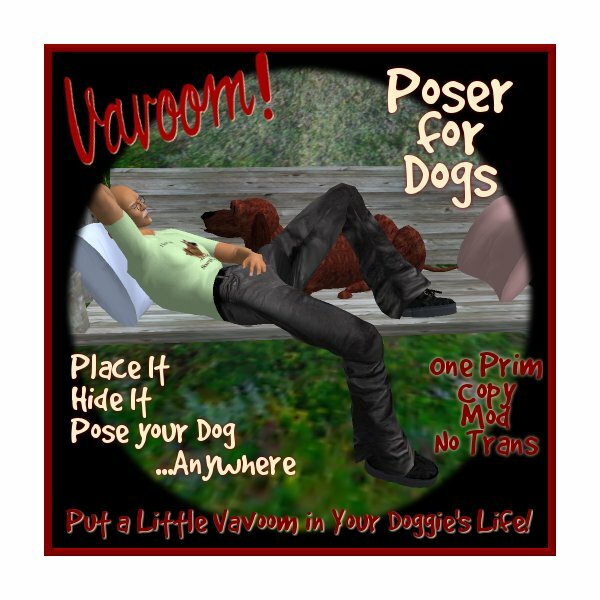 Poser for Dogs | Vavoom! Would you like your dog to get onto your couch and sit or lay down next to you? How about onto your bed? What about having your Chihuahua sitting on the arm of your chair? 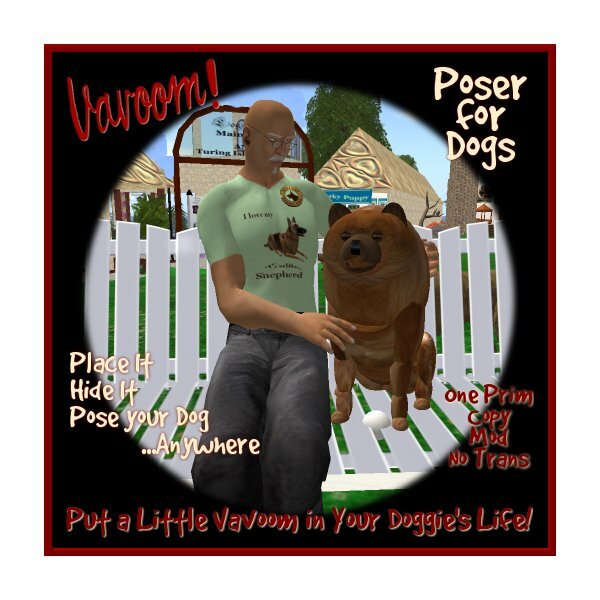 Got an avatar pose ball with a cuddle pose and want to be able to cuddle up to your dog at your favourite beauty spot? Are you going round to a friend’s place and want to get a cute group photo with your dog? The Vavoom! Poser for Dogs is like a pose ball but for dogs! You put it on the ground, or on your bed, or on your chair and your dog can pose on it. It allows you to get some VERY accurate positioning for cuddling or taking photos. With the Vavoom! Poser for Dogs! All it takes is a few quick clicks and you can position your VKC Dog almost anywhere! Rez the Vavoom! Poser for Dogs! Position it on your furniture so that the blue half of the ball is hidden inside the furniture. Rotate the Poser so that the white strip is facing the direction that you want the dog to face. Click on the Poser and choose Setup. In the next menu choose hide. Now choose one of your dog’s names from the list. Let us assume for the sake of illustration that you are going to set up the Poser so that your dog comes and lies down next to you on the couch when you are watching TV. You will see that it is a ball shaped Object where the bottom half is blue and the top half is red with a white flash. Use the Edit tools to move the Poser onto your sofa. You will have to guess the position for the first attempt. But as a rough guide, the dog will be in the middle of the Poser when he poses. Position the Poser so that the blue part is hidden inside the sofa. Rotate the Poser so that the white flash in the top is facing the direction that you would like the dog to face. Click on the Poser and choose your dog’s name from the menu. He will now come over and jump up to lie next to you. The default pose for the dog is “rest”. If you would like him to do something else, you can set the pose by clicking the Poser and choosing Setup and then Poses on the menu. If he is not quite in the right position when he gets up onto the sofa with you, make him get down again. Adjust the position of the Poser and try again. It make take a few goes to get it exactly how you want it. When you are happy with how it is all set up, you can hide the Poser. Touch it and choose Setup and then Hide from the menu. It’s still there, but totally invisible. The Hide option turns it completely transparent. Even though you cannot see it, you can still click the Poser to tell your dog to get up on the sofa with you. If you are not sure where it is, just move your mouse slowly over the area where you think it is and you will see the cursor change from the arrow to the little hand with the finger pointing. If you ever need to see the Poser again, you can choose Setup and then Show from the menu. Another method that you can use to see the Poser is to go to the View menu on your SL Viewer and choose Highlight Transparent. (The Keyboard short cut for this is CTRL+ALT+T.) The Poser will then appear in red (as will anything else with a transparency). When you have adjusted it again, you can turn off the transparency viewing by going back to the View menu, or typing CTRL+ALT+T again. If you are not happy with having the Poser invisible, you don’t have to hide it. You can texture it with any texture that you like. If you wish, later on, to change its position and you need to see the white flash again for the dog’s rotation, you can touch the Poser, choose Setup and then Original from the menu. The Poser will revert to the original red and blue texture. Setup – Open the Menu to show the configuration options. Show – Make the Poser visible. Hide – Make the Poser invisible. Original – If you have re-textured the Poser, this sets it back to the original texture so that it is easy to position and so you can see which direction the dog will face. 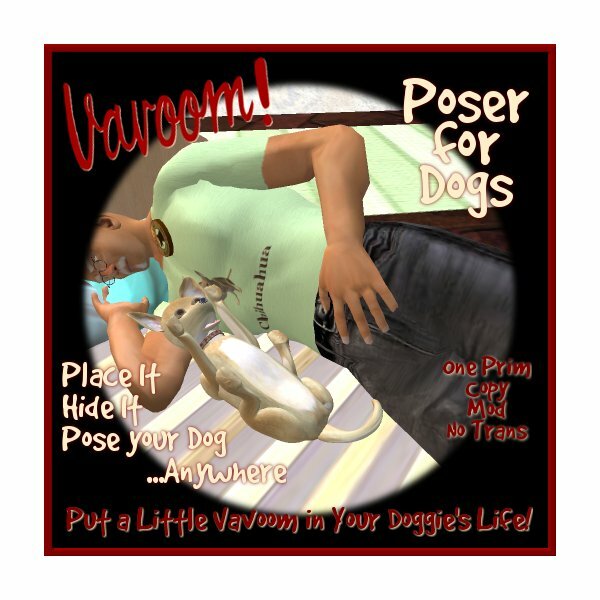 Poses – Show the list of poses that your dog can do on the Poser. If you want your dog to do the Play pose or the Bellyup2 pose, you will have to tell them yourself once they are in position on the Poser. The reason that they are not included here is because they are only (currently) available in the more recent dogs. If you tell the older breeds to do those poses, the effect is not always what you might expect. Vavoom! Poser for Dogs! | Vavoom!